The previous post featured classic children’s books from the 19th century by Lewis Carroll, Charles Dickens, Mark Twain, Robert Louis Stevenson, Rudyard Kipling, Carlo Collodi, and Frances Hodgson Burnett. Now we turn to the 20th century. 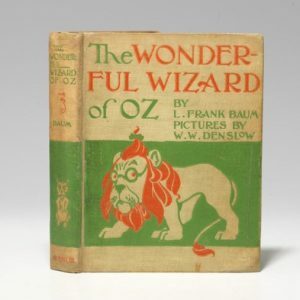 In 1900, L. Frank Baum published The Wonderful Wizard of Oz. 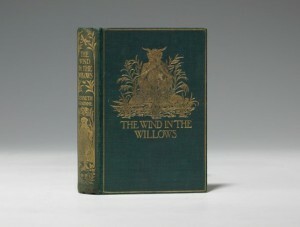 Baum wrote in the introduction that he intended it to be “a modernized fairy tale, in which the wonderment and joy are retained and the heartaches and nightmares are left out.” Baum published 13 Oz sequels over the next 20 years, but the first book is by far the rarest and most desirable of the series. 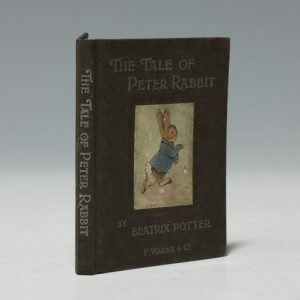 Beatrix Potter was unable to find a publisher after writing and illustrating her first children’s book, The Tale of Peter Rabbit, so she published two very small privately-printed editions with black-and-white drawings at her own expense. 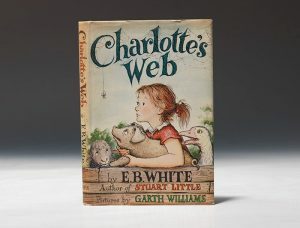 In 1902 publisher Frederick Warne issued the first trade edition with full-color illustrations, which became enormously popular. 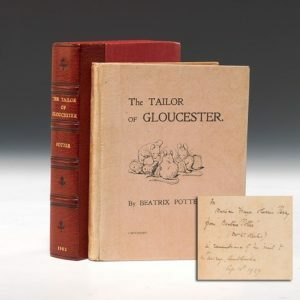 Potter’s second book was The Tailor of Gloucester, which she called “my own favorite amongst my little books.” In 1902 she published the privately-printed first edition of only 500 copies, which contains three additional illustrations and eight pages of text that were cut from the 1903 first trade edition. Potter wrote 23 of her “little Tales” over two decades, featuring a menagerie of adorable creatures, including rabbits, mice, squirrels, cats, ducks, and pigs. Kenneth Grahame’s 1908 The Wind in the Willows, which follows the adventures of Mole, Ratty, Badger and Toad, began as a series of bedtime stories for his son Alastair, known as Mouse. In 1909, President Theodore Roosevelt wrote to Grahame to tell him he had “read it and reread it, and have come to accept the characters as old friends,” and Roosevelt persuaded Scribner to publish it in America. Edward Bear, known to his friends as Winnie-the-Pooh, or Pooh for short, was walking through the forest one day, humming proudly to himself. The four Pooh books, published from 1924 to 1928, were When We Were Very Young, Winnie-the-Pooh, Now We Are Six, and The House at Pooh Corner. 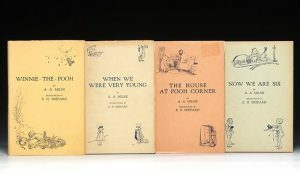 Complete sets of the first editions are quite scarce, and both the UK and US large-paper limited editions of each title, signed by Milne and illustrator Ernest Shepard, are very desirable. 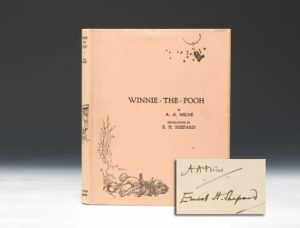 There were only 350 copies of the English signed limited edition of Winnie-the-Pooh and only 200 copies of the American signed limited edition. When Mrs. Frederick C. Little’s second son arrived, everyone noticed that he was not much bigger than a mouse. The truth of the matter was, the baby looked very much like a mouse in every way. Anyone who writes down to children is simply wasting his time. You have to write up, not down. Children are demanding. They are the most attentive, curious, eager, observant, sensitive, quick, and generally congenial readers on earth. They accept, almost without question, anything you present them with, as long as it is presented honestly, fearlessly, and clearly. 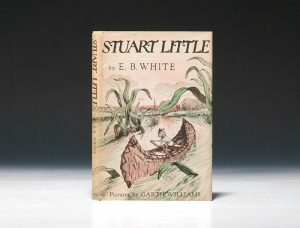 White’s first children’s book was the 1945 Stuart Little, a charming story about a talking mouse born to human parents. ‘This must be a simply enormous wardrobe!’ thought Lucy, going still further in and pushing the soft folds of the coats aside to make room for her. Then she noticed that there was something crunching under her feet. C.S. 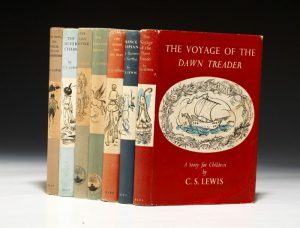 Lewis published his extremely popular allegorical fantasy series the Chronicles of Narnia in seven books from 1950 to 1956. Generations of children have wished they could enter their wardrobe and go to Narnia—where magic and mythical creatures are real and animals can talk—and fight in the battle of good versus evil. The Lion, The Witch and the Wardrobe was the first and rarest of the books. The other titles are Prince Caspian, The Voyage of the Dawn Treader, The Silver Chair, The Horse and His Boy, The Magician’s Nephew, and The Last Battle. 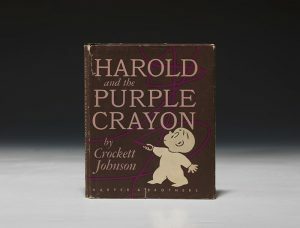 In 1955 Crockett Johnson (whose real name was David Johnson Leisk) published Harold and the Purple Crayon, about a boy who creates his world by drawing it. He published a sequel the next year, Harold’s Fairy Tale, and continued the series until 1963. Theodor Seuss Geisel, who will forever be known as Dr. Seuss, wrote and illustrated his first children’s book in 1957—the immensely popular The Cat in the Hat. 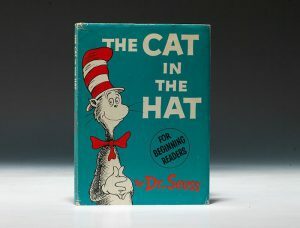 He published a sequel, The Cat in the Hat Comes Back, the following year, and he went on to create over 40 children’s books in his long career. 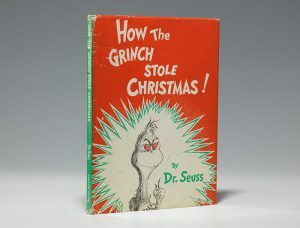 His most famous book, also published in 1957, was How the Grinch Stole Christmas, which quickly became a holiday classic. 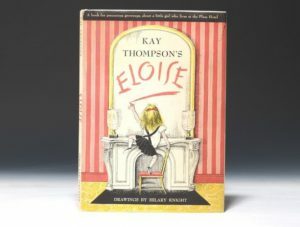 In 1955, Kay Thompson published Eloise, with illustrations by Hilary Knight, the delightful adventures of a little girl who lives in the Plaza Hotel in New York City. 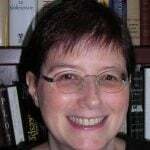 She published three sequels over the next few years, including Eloise in Paris and Eloise at Christmastime. Mrs. Brown caught a glimpse of the writing on the label. It said simply, PLEASE LOOK AFTER THIS BEAR. THANK YOU. I bought a small toy bear on Christmas Eve 1956. I saw it left on a shelf in a London store and felt sorry for it. I took it home as a present for my wife Brenda and named it Paddington as we were living near Paddington Station at the time. I wrote some stories about the bear, more for fun than with the idea of having them published. ‘Something is about to happen’ he told himself. ‘Something peculiar is about to happen at any moment.’ He hadn’t the faintest idea what it might be, but he could feel it in his bones that something was going to happen soon. 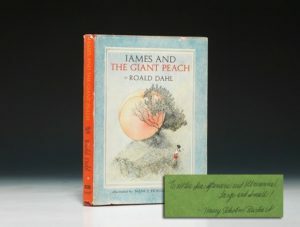 Roald Dahl published many darkly imaginative books for children, beginning with his 1961 James and the Giant Peach, illustrated by Nancy Ekholm Burkert. I, Willy Wonka, have decided to allow five children – just five, mind you, and no more – to visit my factory this year. These lucky five will be shown around personally by me, and they will see all the secrets and the magic of my factory. 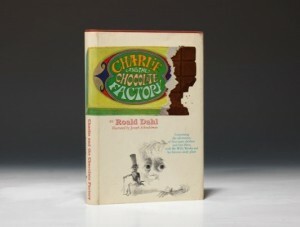 Dahl’s second children’s book is his most famous, the 1964 Charlie and the Chocolate Factory, the unforgettable story of Willy Wonka, Charlie Bucket, and the five golden tickets. Dahl published a sequel in 1972, Charlie and the Great Glass Elevator. We’ll end Maurice Sendak, one of the most beloved children’s book artists of the 20th century. Sendak illustrated more than a hundred books over six decades, of which the most famous is Where the Wild Things Are, which he both wrote and illustrated. 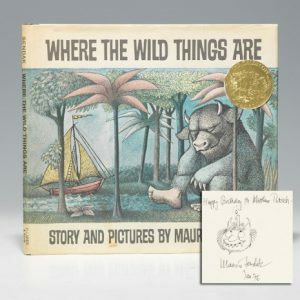 The 1963 first edition is extremely rare, and signed copies with drawings by Sendak are very desirable. Some of his other notable illustrated books include In The Night Kitchen and The Nutcracker. 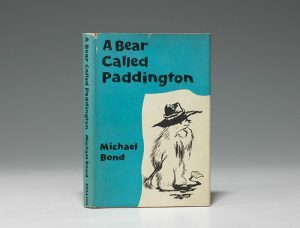 You can browse hundreds of classic rare children’s books on our website. For additional ideas, speak with our staff by phone or in person at our galleries. If you’d like assistance or personalized suggestions, or to inquire about a book that’s on reserve or no longer available, call us: 212-751-0011 (East Coast) or 702-948-1617 (West Coast).